Well yeah, that’s sort of a big, fat, lie. It’s more like the last couple of months in review, and last night in review. If I think of something better before I stop writing I’ll change it. So I asked Cat if she had something to say NON-PET RELATED. So she sent me the above screen shot. It doesn’t count Cat, you weren’t even there! That sullen Warlock Cimmeria went to Amateur Azerothian’s LBR last night. She won’t admit it but she had a good time. She was in a snit cause I made her wear a gaudy sweater and sing carols. Sheesh … Warlocks … no holiday spirit at all. Great fun was had and guess what? Another Greatfather Winter showed up! Yes, I know that looks like a Gnome Shadow Priest but it’s really Greatfather Winter! 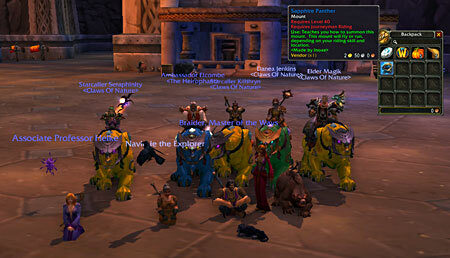 After we finished Molten Core and Blackwing Lair, Greatfather Huckle pulled out many glorious pets we could roll on! Wontan was the big winner, I think everyone was afraid to roll against a stabby, little, Gnome Rogue. Cimmeria won’t admit it, but she’s scared of stabby, little, Gnome Rogues. Scary guys. Azilem of Frost and Claws was there looking incredibly good in her holiday finery. And she’s even got a strategy for Razorgore posted so since he was stingy last night I can now return with a plan! I was so happy I finally got the right night and right time so I could make it to the last LBR of the year! As always, JD and the Missus threw a great LBR! I’m running out of space for the whole year in review thing. I always feel I’m pushing my luck if I natter on too long. Okay, I’ll just ask Cat if she’s got anything to say for herself. Yay! Take that you stinkin little Thundering Spirit! Nah nah na na nah! Who’s the woman now, huh! I did it! I did it! I got your Earth Spirit right here! And you know what? I’m not leaving you alone … no, I’m coming back every day until you give me another and another and … pssst … hey Cat, mature much? Want to move it along? Anything else? Yeah, I’m doing dailies again. Oh good, working for the Shado-Pan and Klaxxi then? Um … well no. It’s this whole Operation: Shieldwall thing, well it’s for the King! Really? Is that REALLY why you’re doing that instead of what you SHOULD be finishing? It’s not perhaps something else? Something like RODENT TRAPS! Oh geez Cat, really. I know, I know, you just have to have a Sumprush Rodent. I should have known it would be battle pet related. Any final words for the year? Been up to anything else? Um … I’ve been thinking of taking a remedial reading comprehension class in the new year to better myself. Really Cat? Any particular reason? Um … yeah … no. Just might prove helpful, save money on repair bills and all. I didn’t really notice that Huntsman Blake said, would WE … WE as in multiple people, like to fight that Crane … it was a costly mistake. I see … anything else you’d like to share? No, I guess not. I’ll save my quest to get the achievement, I’m In Your Base, Killing Your Dudes for next year. I don’t want to kill the holiday spirit with too much talk … talk of death. I see. Well I guess that’s it for 2012. I guess Cat will review it next year. Happy New Year and take care out there! Yesterday I belatedly started to level poor Sasche, my Forsaken Warlock, in preparation for a LBR. 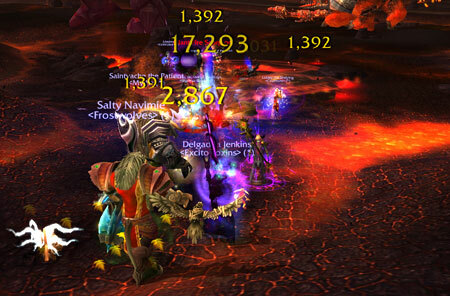 Blizzard’s site said iLevel 355 was required for Firelands. She only made it to 351. She’s really annoyed all those Alliance characters are already into Pandaria and she isn’t. I promised I’d make an effort from now on, but I have developed such an aversion to Garrosh it’s difficult. I whispered JD, master of ceremonies, that I’d be little help in Firelands but he said to of course come and to also make a character on his server. Okay, maybe his guild is having a party. Maybe they have a glut of D.I.S.C.O.s to use. It was really hard to not get hung up in the creation process but I managed to only change the character’s hair. I showed great restraint I think. And of course it was a Warlock. So we all get to Ironforge and yay! A party! But then we were all given a wrapped party gift, what’s this? OMG!!! OMG!!! JD in the guise of the incredibly suave persona of Elcombe had given us all Panthers just … just … BECAUSE!!!! Those that could, mounted up! It was so exciting and wonderful! Thank you again JD! I can’t even begin to imagine the amount of auctionating that went into that! I don’t know about the others who were there with level 1 characters, but I wanted to immediately level up so I could ride like the wind! But I’d promised Sasche so off she went to Firelands. Notice in this screen shot my obsession with pets. There’s all kinds of great stuff going on and I’m fixating on shots of Navi’s pet. With the experienced leadership of the writers of Reputation Grind and The Crimson Hammer, even in her hand-me-down clothes Sasche got to participate in downing some of the bosses before I had to leave. So what’s with the Padaren up at the top? Well, leveling another of many Warlocks scattered around all the servers didn’t seem special enough. No. This is a most special gift. Funny how a virtual gift can mean as much or more than something in the real world, but it does. So this morning Liwu was created. 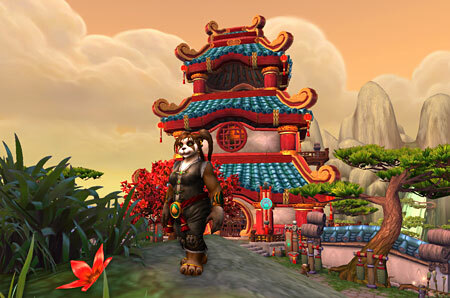 I think my first Pandaren to level all the way up should be the proud recipient of that Sapphire Panther. Nothing else seems right. Google translate tells me Liwu means gift in Chinese, they didn’t say whether it’s Mandarin or Cantonese and I hope they aren’t being jokey with me and it’s a dirty word or anything. I don’t know how jokey they are at Google. You never know. I’m pretty jokey. So I have a lot to do. Liwu is going to be leveling fast, I know. Cat just got Master of the Ways done so she’s fine with it. So if you don’t hear from us it’s because Liwu is wreaking damage and destruction across the Wandering Isle. Everyone is pretty much alright with it, because that was such an incredible gift. Thank you JD.